They call it Australopithecus deyiremeda. The name comes from a language spoken in the Afar region of Ethiopia and means “close relative”. This is a brand new and previously unsuspected species – discovered in Ethiopia – that lived at the same time as one of our potential ancestors: “Lucy” (A. afarensis). There are few things more exciting to a palaeontologist than the discovery of a new species. 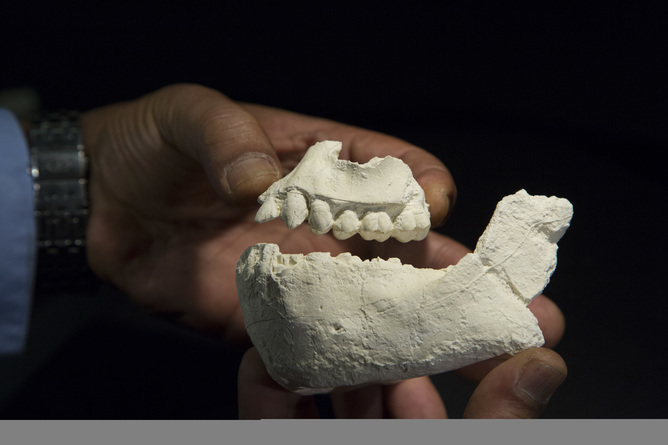 Work will now begin to try to figure out exactly how this hominin relates to our own species. The discovery was made from a number of fossils, dating back to 3.5m-3.3m years ago. They comprise part of an upper jaw bone with some of the teeth as well as most of a lower jaw bone with a few of its teeth. There are also a couple of other fragments of jaws and teeth. The fossils raise many questions that are hard to answer. For instance we can’t know whether the hominin actually walked upright, as there are no bones apart from the skull bones available. The researchers, who report their findings in the journal Nature, have previously found fragments of a foot bone in the same area which dated to 3.4m years ago. The owner of this foot may not yet have completely left the trees. 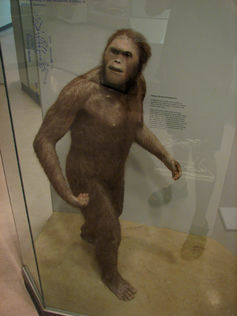 As there are specimens of Lucy’s species A. afarensis not far away, it is likely that the two were contemporary. We know that Lucy and her kind were bipeds as we have their foot bones. There is also an amazingly preserved footprint trail in Laetoli, Tanzania. Lucy stood tall at 1.1m. The foot of A deyiremeda – if that earlier discovery of a partial foot does turn out to belong to this species – is quite different from Lucy’s. There are other Australopiths around at the same time too. In Chad there is the enigmatic A. bahrelghazali, only a little older. In South Africa, there’s the Littlefoot skeleton from Sterkfontein, recently re-dated to 3.7m years ago. Some palaeoanthropologists want to interpret Littlefoot as a new species of Australopith A. prometheus, but others are reluctant to identify it as a new species yet. But the case the discoverers of A. deyiremeda have put forward supports their fossils being a new species. There are numerous differences in the jaws and teeth between these remains and those of other species of Australopith. Further south in Kenya there is another hominin around at the same time, not only a different species, but one belonging to a wholly different genus – Kenyanthropus platyops. However A. deyiremeda is not like this either. Exactly where A. deyiremeda fits in among our ancestors is, however, hard to know. We are Homo sapiens sapiens. Our genus, Homo, is the family we belong to along with our extinct cousins like Homo neanderthalensis and possible ancestors like Homo erectus. Our species is sapiens, meaning wise, and we add another sapiens on to our name to distinguish ourselves from the very earliest members of our species. But here is the thing: we are the only species in our genus – and, from an evolutionary perspective, that is not a healthy sign. Up until today, genus Australopithecus had six, maybe seven species in it depending on who you believe. Now that is an astonishingly successful genus as far as evolution goes. The oldest yet found is A. anamensis, which is more than 4m years old. The youngest is A. sediba which is about 1.9m years old. That’s a life span of nearly two million years between these species. The reason so many species can emerge is because natural selection experiments with different adaptations and different ecological niches. 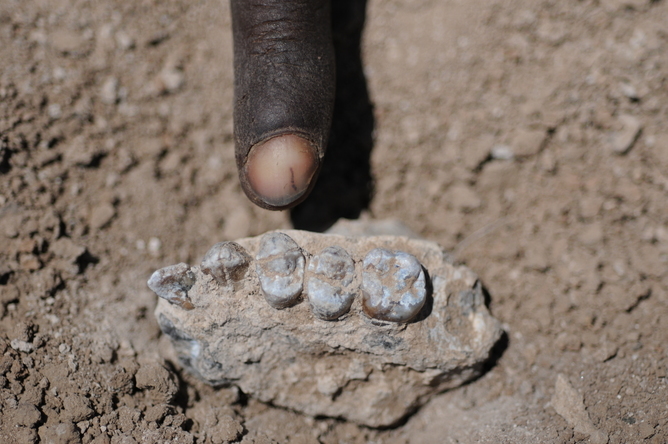 The newly discovered A. deyiremeda comes from the earlier phase in Australopith evolution. Exactly how it relates to our own species is hard to know. However, many of the features of its jaws and teeth are seen in later hominins, particularly a group of flat-faced ape men called Paranthropus. These are not on our evolutionary line. The researchers also describe some similarities between A. deyiremeda and early Homo, but in the paper they also point out some important differences between the new discoveries and the earliest known member of our own genus, currently dated to 2.8m years old. So for the moment this is an open question. But there is a last twist to the tale here. For a long time we believed that members of our own genus were the only tool makers in the hominin record. Now we know that’s not true. Recent reports have established the oldest yet discovered stone tools date to 3.3m years ago, that’s half a million years older than the earliest member of genus Homo. Tool making may even go back a little bit further. There are contested cut marks from stone tools on bones dated at 3.4m years ago at Dikika in Ethiopia. Guess which species are around at that time in East Africa? You guessed it: A. afarensis, K. platyops and A. deyiremeda. Up until today it was K. platyops that was the favoured candidate for this early tool maker, but today’s announcement of A. deyiremeda puts a new player in the game. John McNabb is Senior Lecturer in Palaeolithic Archaeology at University of Southampton.